I’m back again for a new weekly update. A tad too late to really be counted as a weekly update, but nonetheless! This week I’m going to share some of my experience with the Unity 3D game engine so far, and shortly discuss some of it’s greatest strengths and why I have choosen to use it as one of my weapon’s of choice for this semester. Unity 3D is being continously developed by Unity Technologies, and it is according to me one of the most powerful and versatile game engines currently on the market together with Epic Games’ Unreal Development Kit (UDK). I have only worked with Unity 3D for a couple of weeks now, but below I’ll list some of the features that made me dive deeper into the engine. Unity 3D has a very wide range of platforms that you can deploy to, including PC, Mac, Web, Android, Iphone, as well as the current generation of stationary consoles. This is probably one of the engine’s greatest strengths. From my experience Unity 3D is fairly easy to use and get into. The interface is streamlined and functions and features are often self explanetory. 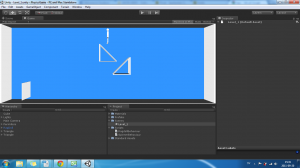 Also, there are a lot of systems already in place for you to use, like first person controllers and particle effects. There are a lot of developers that are currently using Unity 3D. This opens up for a large community where you can share ideas and thoughts, as well as quickly find help and solutions if you get stuck. Unity 3D has a very reasonable price for the Pro version, which lets you deploy to PC, Mac and Web. Additional licensing is required for the other platforms, like consoles, Android and Iphone development. The Pro version gives you access to more features, for example the ability to use external version control and more powerful graphical features. However, there is a free version with the more advanced features removed, as well as discounted student licenses. But the best thing is that Unity Technologies does not take any royalties what so ever for anything you create and sell with any of the licenses. Great! What am I doing with Unity 3D right now? For the last couple of weeks I’ve been going through tutorials and trying out different things to get the hang of most of the features that Unity has to offer. I’ve mainly been using 3DBuzz’s excellent video tutorials to get the job done. These are really great and you should check them out if you want to learn Unity. They go through everything from the most basic user interface to more advanced features like light mapping. 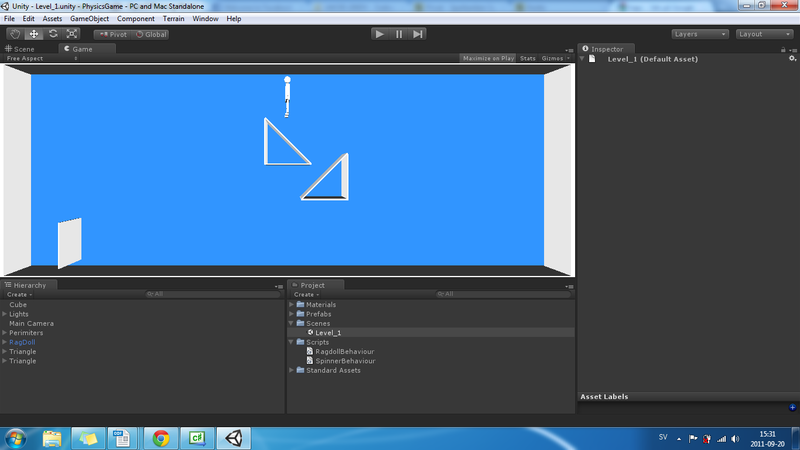 Below is a screenshot I took when working on one of the tutorials where you build your own first level. 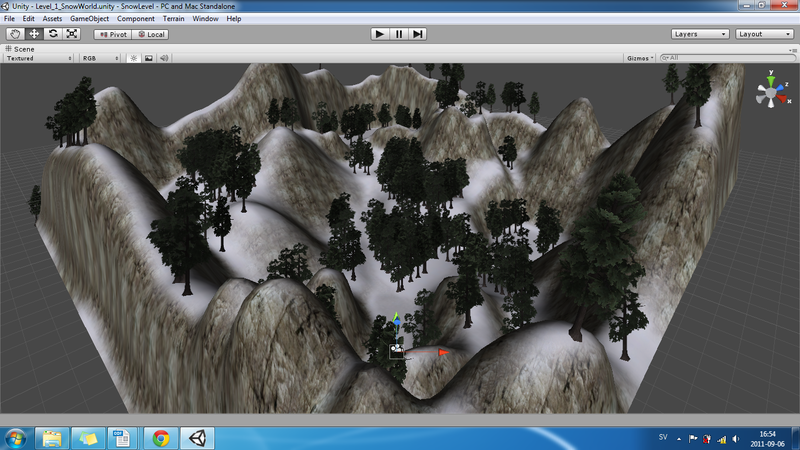 Working with terrain in Unity 3D. Starting today, I’m working on a small project that will result in a short and simplistic physics game. It will be the player’s job to guide a ragdoll through different levels, hopefully keeping it reasonably intact until it reaches its goal. The player will be able to place different contraptions in the ragdoll’s way to help him avoid danger and guide him home. Below is a screenshot from todays work. Still a lot to do, but when its done you’d better: Be fast, use as few contraptions as possible, and keep that ragdoll intact! Physics Game: Work in progress. As promised, I am returning this weekend with a short update on what things I’m currently working on. So lets get started! This first thing is an adventure game that me and six other developers are currently working on. It is called Sjörök. Sjörök is a first person experience and entirely in swedish. It takes place in a fictitious 19th century swedish archipelago, long since abondoned by the inhabitants who once lived there. Through puzzle solving and exploration, the player will find out what happened in this mystical and sometimes quite psychedelic environment, with its abandoned islands and misty waters. The game will be released shortly, but in the meanwhile feel free to look at some beautiful screenshots or listen to bits of the soundtrack over at Sjörök’s Facebook page. You can also find a bit more information there, but it is all in swedish. My work in school this semester is amongst other things going to involve a deeper dive into the Unity 3D game engine. The versatility and accessability of the engine has made it my choice for game development in the foreseeable future, and I am just now learning the ropes of it. In my next weekly update I will share with you some of my experiences with the engine so far, so stay tuned! It’s been a long time now since I last visited my site and shared something with all of you. Despite this, I’ve not been idle in my Game Development endevours, and many projects have unfolded since my last post (which was very long ago I’m afraid). Now that I’m back though, I felt that my site needed a bit of a revamp to a more clean and easy-on-the-eye look, so therefore I’ve reverted back to the standard look while I consider what changes to make. Besides this little layout change, there is more. Starting with this post, I’m going to crank up my activity here on the site and share a lot more of what I’m doing with you guys. My plan is to keep you updated at least once a week about what I’m working on, how it’s going, and my thoughts and perspective on it all. I’ll return at the end of this week with a little more information for you to chew on.